Karima Bennoune: Can you explain the aims of the Barakat movement and the recent history which shapes it? Dr. Amira Bouraoui at a Barakat meeting in Algiers, 22 March 2014Amira Bouraoui: The goals of the Barakat movement are to establish democracy in Algeria. For much too long, the Algerian people have been subjected to the law of a regime that does not apply the rules of democracy. In fact, Algeria has gone through very difficult times. There was already a kind of Barakat Movement in 1988 when, motivated by social injustice, youth took to the streets to express themselves. It ended badly at the time. Subsequently, because people could not express themselves, part of the society took refuge in the arms of God. Some joined a political party (the Islamic Salvation Front, FIS) that tried to monopolize religion. But, what belongs to everyone – because most Algerians are Muslims –cannot belong to a political party. Meanwhile, the ruling party (the National Liberation Front, FLN) tried to monopolize Algerian history. History also belongs to everyone, and cannot belong to a single political party. What we want today is a democracy that shields us from the risk of all these excesses. KB: What was it about President Bouteflika’s record that inspired your protests? AB: Mr. Abdelaziz Bouteflika came to power in 1999 – 15 years ago. The Algerian constitution had been amended a few years earlier so that its Article 74 limited presidential terms to two. In 2008, Mr. Bouteflika increased the salaries of legislators. He thereby influenced the deputies to violate the constitution by amending it without a referendum, without the opinion of the people being expressed, and so the third term was stolen. We were very attached to Article 74 because even if Bouteflika was “elected” in conditions that were not very transparent, people said to themselves he will be here for two terms, and then he will go. When a president has term limits – like in many democratic countries - he knows he will have to leave one day, and he tells himself that one day he will have to give an account of what he has done. When you know you will have to account for your actions, you work hard and you try not to make mistakes. But when you decide you will stay in power until you die, like a dictator or a monarch, you think you can do anything you want. You think the republic belongs to you, and this is not the case. When you go back to President Bouteflika’s last speech of May 2012, he said ‘my generation is finished.’ He said that a man must know his limits. He said this in Arabic. We were somewhat reassured in May 2012 when he said ‘we must pass the torch’ – a torch that is preferably lit and not extinguished. Despite a third stolen term, we thought we would finally have elections that would bring back hope. Every generation needs hope. A president who stays in power for more than ten years, for more than two terms, presides over a generational transition. And the new generation is no longer connected with a president who stays too long in power. Nevertheless, this year we saw politicians calling on the president to seek a fourth term even though he is very sick, and has been in power for 15 years, and the constitution has been violated, and we had not seen him in public for two years, and he had not even given a speech for two years. Both physically and mentally, he is in no condition to govern. 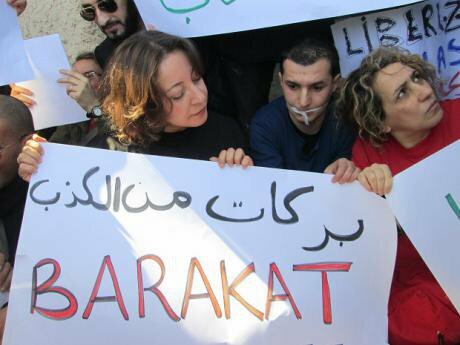 So, we decided with activist friends to go out into the street and to say, ‘no.’ ‘Stop!’ We did not expect the rapid popularity of Barakat, a movement that was just created on March 1st. KB: What is it about a fourth term for President Bouteflika that is so unacceptable? AB: Before President Bouteflika’s candidacy was announced, many, many Algerians – in universities, cafés, businesses, hospitals - would say, ‘no he would not dare to go for a 4th term.’ That would be unacceptable. The 4th term is simply the symbol of a regime and a system that is archaic. This regime and this system have contempt for the people, deeming them immature. They think the people are stupid. But they do not realize that the people are so aware of the situation that that is why they do not vote anymore. They have not had the right to a real choice. We are witnessing an electoral masquerade, a process designed to impose Abdelaziz Bouteflika for a 4th term. Instead, we call for the people to be really and truly consulted about its choice of leader. KB: The threat of instability is often used to silence protest in Algeria, given the terrible events of the dark decade of the 1990s. How do you respond to this argument? AB: Our anger, our rejection commenced when President Bouteflika violated the constitution. At the time, we wrote and signed petitions. We tried to protest, even if we had just come out of a decade of horror. Algerian citizens were afraid: afraid of destabilizing the country, afraid of falling again into a cycle that had hurt us very much in the past. But we find that this stability-through-blackmail that the regime offers us now, telling us to shut up or else we risk destabilizing Algeria, is unacceptable. We will not play this game. It is like they are saying, ‘let us run the country in a non-transparent manner. Do what we want. Then, in return, you can have stability.’ We think that what has actually destabilized Tunisia, Libya and Syria, and the countries of the “Arab Spring,” was precisely that dictators did not know when to leave. KB: What is your strategy from here until Election Day on April 17? Perhaps even more importantly, what will your strategy be afterwards? AB: From now until April 17, we will continue to organize actions aimed at pressuring the non-responsive regime, and trying to make it hear reason. The regime tries to justify the unjustifiable. It defends the indefensible. Those in power need to realize that they are running right into a brick wall. After the 17th, we will continue to struggle, and we will continue to be present on the ground, so as to reject this illegitimately elected president. Most Algerians do not even have a voting card, have never had a voting card, and do not plan to vote because for them the outcome is a foregone conclusion. "Enough lies." Dr. Amira Bouraoui sits in at the National TV station in Algiers, along with other members of Barakat on Mar 24. KB: The Barakat Movement has said many times that it is a citizen movement which is political but non-partisan. What does that mean? AB: We are a citizen movement, made up of Algerian citizens who were not all political activists. We work for democracy and the acquisition of citizenship. When you have not chosen your president, you are no more than a pilot project of a citizen. You are not an actual citizen. I would say Barakat is supra-political, because to permit political parties to take part in democracy, you must have rules of the game that are clear, transparent and respected. This citizen movement aspires to create these rules. We do not want to be a political party, and we do not want to be political in the partisan sense. KB: You have received a great deal of support, including on your FACEBOOK page where you now have been “liked” by over 30,000 people in just one month. However, you are also being harshly critiqued by some, often in what appears to be an organized way. Why do you think this has been the case when you are such a young movement? AB: The government did not expect that there would be such a vigilant civil society. They thought, ‘we got a third term, so we will get a fourth term in total silence.’ They thought we were dead somehow, but we were only in convalescence. We were learning to walk again, and soon we will be able to run, so as to protect the republic and democracy. The government used every kind of propaganda to try to tarnish our movement. They invented so many lies, and they called us every conceivable name, just because we aspired to be citizens and to defend democracy. But, we will not give up. They do have the capacity to inflict damage with their propaganda because they have television stations and newspapers at their disposition. They are trying to turn public opinion against those of us who contest this electoral masquerade. We are called everything from the tools of the foreigners to Zionists. It went very far. We were called supporters of the FIS (Islamic Salvation Front), and then “eradicators” (a term used to smear staunch opponents of fundamentalism) all at the same time – whatever can give us a bad image in the eyes of the public so as to put us on the back foot. However, we will stay the course. KB: Barakat is, first and foremost, an Algerian movement speaking to an Algerian audience, but do you also have a message for the international community? AB: We are for the freedom of all peoples, and we would like Algeria to work with other countries, whether western or others. But, we would like this to be in the context of a win-win situation, not a win-lose situation. We sense now that the government tries to buy the silence of the international community by opening the valves of oil. It even tries to kill the conscience of a people. What we would like is that the freedom of a people not have a price on it. Algeria is not alone in the world. It aspires to work with everyone, but this should be for the benefit of everyone. And we do not want our young people to be left with no other dream but that of a visa with which to flee to El Dorados - countries which are actually sometimes also in economic crisis. We want justice and democracy, and there is nothing else but these things that can lead to peace among peoples. KB: What has the experience of Barakat’s first month been like for you, one of the movement’s most visible representatives? AB: I had to take 15 days off of work as a doctor because I was badly manhandled during my first arrests. The way I was arrested was very difficult for me because I had had back surgery. However, I am going back to work tomorrow. I love my work. I think human beings are not born simply to eat and sleep. We are born to dream of freedom, to realize our dreams, to defend our ideas, to think. In Algeria they want to keep us from thinking and expressing ourselves. So, I have been arrested 5 times. I was also arrested in 2011, and before that, because this is not the first time I was active against this government. I do not like injustice. It pains me, whoever is the victim. I guess it is a personal trait. How did I live this? I did not expect all this media attention. I am someone who prefers discretion, so it was quite difficult. I have been under a lot of pressure. Members of my family have also been under pressure. But, if my voice and image can help the cause, then it is worth it. 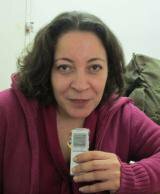 This interview was recorded and translated from the French by Karima Bennoune in Algiers, March 22nd 2014.